Few rooms of your home need ample light and forgiving surfaces more than your kitchen. Glass Block gives you both, with the added bonus of its lasting, maintenance-free good looks. Open up the heart of your home to the great outdoors, to adjacent living areas and to the decorating drama of a few dozen ... or even just a few... glass blocks. Glass block and glamorous baths -- one implies the other. But in the bath, one of the hardest-working rooms in your home, any surface that's as water-repellent and wipe-clean practical as glass block has a beauty that's definitely more than skin deep. 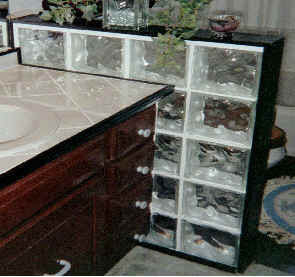 It doesn't take much more than a touch of glass to make a bath more functional, more beautiful and easier to maintain. The variety of patterns, sizes and textures available lets us adapt to your decor, not the other way around. With Glass Block windows and panels, natural and artificial light can be used to produce beautiful and dramatic effects. Enhance the security of your home by turning any high-risk window into a safe, secure window. Intruders like basement windows because they're easy to break or pry open and are often shielded. Reduce the threat of forced-entry by installing pre-assembled Pittsburgh Corning Glass Block. Additionally, we will will highlight risks and pitfalls. This is especially critical on renovation and/or restoration projects. Contact Tile Artistry to begin the planning process. Our professionals will advise you on how best to utilize Industry Best Practices on your floor tile project.